I am very blessed to say that I have been to just about every major sporting event possible. In my time working with Upper Deck I have been privileged to attend the NBA Finals, the World Series, the Super Bowl, the BCS National Championship, the NHL Stanley Cup Final and a bevy of other great sporting events. So I feel pretty qualified to speak about what makes a great sporting event. On Saturday, December 1, I am happy to say I added the MLS Cup to my list of great sporting events I have attended. I know what you are thinking, “Is soccer really a great sporting event?” This game absolutely was. There are six elements that I believe make for a great sporting event and the 2012 MLS Cup had them all. 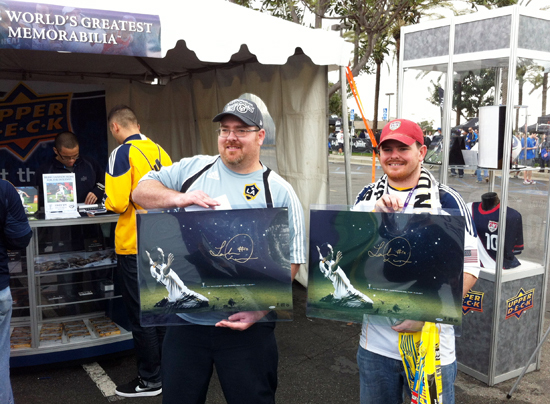 Two LA Galaxy fans who were also brothers both scored a sweet UDA signed photo of Landon Donovan before the big game on Saturday. Fans – I was blown away by how passionate and loyal the MLS fans were at the championship game. They were all decked out in team gear from head to toe. I was surprised that Houston Dynamo fans were able to find so many different forms of apparel in their team’s color and they wore the gear with true pride. The Houston Dynamo fans were decked out in their team colors from top to bottom! Upper Deck was set up in a corporate area before the game and we had a great opportunity to meet the fans as several took advantage of special offers on Landon Donovan autographed memorabilia in particular. There were spirited exchanges between the two fan bases before and during the game which helps make for a really memorable experience. As their passion swells over, you find yourself immersed in the experience and you cannot help but get excited about what is going on. 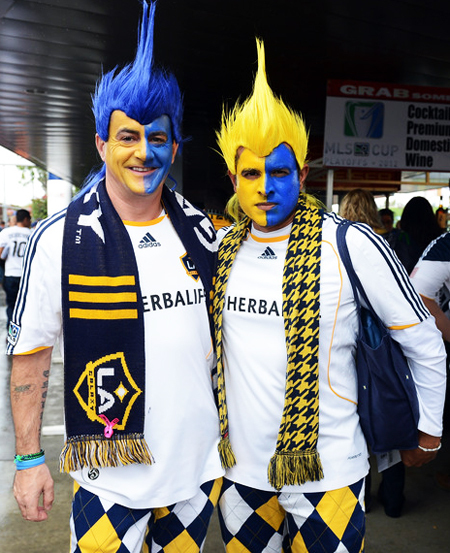 Everywhere you walked at the Home Depot Center you would find die-hard soccer fans like these guys. Venue – It is crazy to me to think that in a relatively short time the LA Galaxy have gone from playing in the Rose Bowl to having an awesome new soccer facility at their disposal. The Home Depot Center is a very nice soccer venue with lots of parking, areas to tailgate and a good all around vibe. To see it filled to the brim with a record crowd was awesome to behold. David Beckham has done a lot to help promote the game of soccer in the US and he helped create a legacy of success for the LA Galaxy. Stars – The LA Galaxy roster is loaded with stars like David Beckham, Landon Donovan and Robbie Keane. For Houston however, their greatest star may be one the sidelines with their coach Dominic Kinnear. Many believe he is the leading candidate to become the next coach of the US national soccer team after the 2014 World Cup. He simply knows how to get the most from his team and puts his players in the right situations to be successful. Fans got to their feet every time David Beckham took a penalty or corner kick. A Story – There were a couple great story lines to pay attention to for the game. 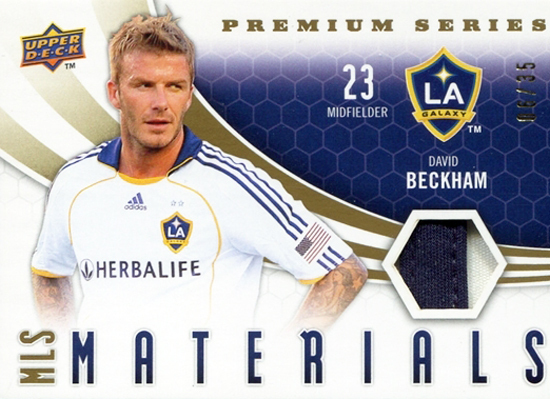 The biggest was that this would be David Beckham’s last game as a member of the LA Galaxy. In his time with the club, he worked hard to make soccer a major sport in the United States and based on how many Beckham jerseys I saw at the Home Depot Center, it is clear he made an impact with fans. When you have a player that transcends the sport playing in the championship for what will be his last game with the team, you have a moment that is undeniably special. Above and beyond that was the match up itself. The Houston Dynamo are an extremely successful franchise having won the MLS Cup in 2006 and 2007. Additionally they faced off against the LA Galaxy in the MLS Cup just last season so fans were very excited about the opportunity of a rematch and the establishment of a great new soccer rivalry. Drama – The game had plenty of drama to make it special. The LA Galaxy missed a couple great scoring opportunities in the first half and the Houston Dynamo capitalized with a great goal towards the end of the first half by Calen Carr. With the Galaxy down by one at half, there was a lot of nervous tension in the stadium. Would Beckham’s last game end in a loss? Would the Dynamo avenge last year’s MLS Cup defeat? Things did not look good for Galaxy fans. A Great Finish – In the second half however the Galaxy roared right back playing inspired soccer scoring three unanswered goals and taking home the 2012 MLS Cup in front of their extremely loyal fan base. With each goal the crowd was thrust into more and more of a festive frenzy. It was the perfect Hollywood ending with stars like Robbie Keane and Landon Donovan all playing a big part in the comeback and David Beckham riding off into the sunset as a champion. Champions again! What a great moment for the LA Galaxy! I must admit, I did not have high expectations for the game going in so I left the stadium totally shocked by the great sporting experience I had just been a part of. The MLS may be one of the most underrated sports in the nation. It is a great value with great play that provides fun for the whole family. I can’t wait until next season to check out more games and cheer on the LA Galaxy to hopefully a 3-Peat! Week 28: 2017-18 NHL® Game Dated Moments Packs are Now Available on e-Pack! Week 25: 2017-18 NHL® Game Dated Moments Packs are Now Available on e-Pack! Week 24: 2017-18 NHL® Game Dated Moments Packs are Now Available on e-Pack! Week 22: 2017-18 NHL® Game Dated Moments Packs are Now Available on e-Pack!